Me and my ever-growing collection of arm candies! 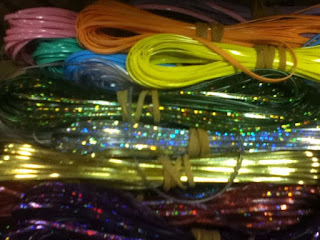 I've taken up a new pastime to make bracelets of various colors, materials and designs when I am free. I absolutely love matching my bracelets with the current day's outfit, so having a wide variety offers fun combinations and options. And what will be better than wearing my own artwork! I bought lots of ribbons, strings and chains in various textures and colors, and have been coming up with different combinations. Of course, the plainer ones are usually monochromatic, but for the more funky designs I try to mix at least 2 colors. I even managed to find rainbow thread, so some of my pieces have a whole myriad of tones! My favorite thing about making my own bracelet is that I have total control over the length and fit, hence I can always ensure that the bracelet is extremely comfortable and most suitable for layering with my watches. I actually customise the length according the position where I wear it- either above or below the watch, so it's important to get a good fit for the length to maximize the bracelet's utility. For convenience, I sort my bracelets in a clear plastic case with dividers. I can see all the goodies without opening the box, so it's fast and easy for me to plan my outfit. OMG! I so want to DIY my own bracets and get into the whole arm candy fun, but i have terribly small wrists hence i need to make my own bracelets. The thing is i can't find any decent craft stores in JB or KL. Where did you buy the materials to make your bracelets?? There are some craft shops that sell materials but the selection is limited. I actually get stuff on ebay as it's easier to compare the prices, and the wholesale ones are pretty cheap. The only downside is that the shipping is very slow and takes quite a long time for the materials to arrive!